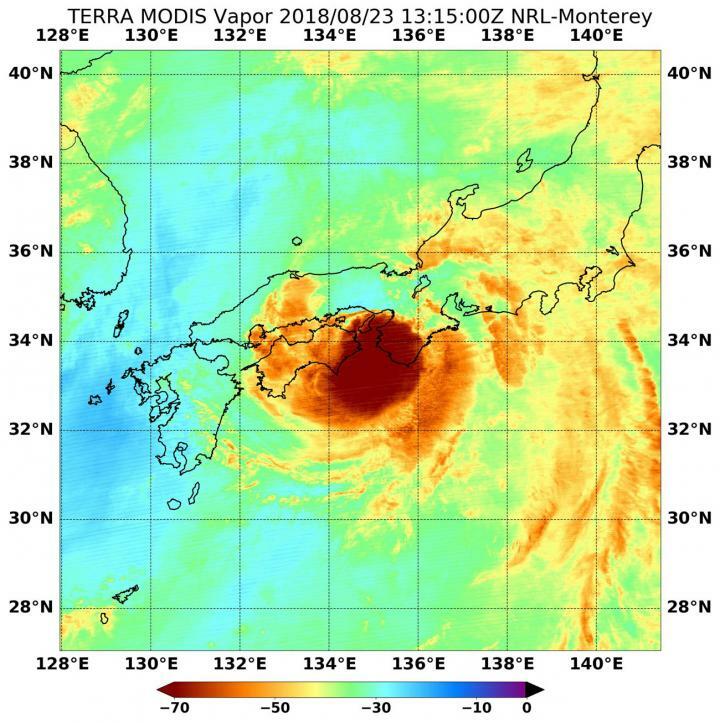 NASA's Terra satellite provided a look at water vapor Typhoon Cimaron and found the strongest storms displaced from the center as it began a landfall in southeastern Japan. Water vapor analysis of tropical cyclones tells forecasters how much potential a storm has to develop. Water vapor releases latent heat as it condenses into liquid. That liquid becomes clouds and thunderstorms that make up a tropical cyclone. NASA's Terra satellite passed over Cimaron on Aug. 23 at 9:14 a.m. EDT (1314 UTC) and the Moderate Resolution Imaging Spectroradiometer or MODIS instrument aboard found the strongest storms off-center. At 11 a.m. EDT (1500 UTC), on Aug. 23 the circulation of the system appears asymmetric tropical cyclone with deep convection obscuring the low level circulation center and convection being suppressed to the west of the low level circulation center. The center of Cimaron was located near latitude 34.9 degrees north and longitude 44.1 degrees west. The storm is moving toward the north. Maximum sustained winds are near 86 mph (75 knots/139 kph) with higher gusts. The JTWC noted "the typhoon will be tracking northeastward and, after passing quickly over Honshu, be undergoing extratropical transition over the Sea of Japan. By Aug. 25, the cyclone will have completed extratropical transition and begin merging with Tropical Storm Soulik into a mid-latitude cyclone".